The President will meet with members of the 104th Battalion today, visit Camp Shamrock, and lay a wreath in memory of those who have lost their lives. 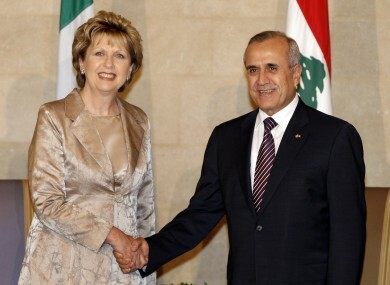 PRESIDENT MARY MCALEESE is in Lebanon on a three day trip, her final official overseas visit. She’s to meet with Irish peacekeeping troops today at Camp Shamrock, and will receive a briefing on the work of the United Nations Interim Force in Lebanon (UNIFIL). President McAleese will tour the camp and meet with members of the Irish force there. The President is returning to the scene of her first visit in the role, back in 1997. Today she’ll present medals to 72 personnel who are on their first overseas mission, and she’ll also address the 104th Infantry Battalion, who left for Lenanon in June. The 200 troops joined another 240 personnel to undertake peacekeeping duties. A nearby orphanage at Tibnin, which is supported by fundraising efforts by Irish personnel, will also be visited by President McAleese who is joined in Lebanon by her husband and by the Minister for Justice Alan Shatter. While at Tibnin the President will lay a wreath at the Irish UNIFIL memorial, to honour the memory of the 47 soldiers who have died while on peacekeeping duties in Lebanon. Mrs McAleese met with the Lebanese president Michel Suleiman at the Presidential Palace in Baabda, east of Beirut yesterday evening. Email “McAleese to meet Irish troops in Lebanon on final official trip”. Feedback on “McAleese to meet Irish troops in Lebanon on final official trip”.